The Republic of the Maldives, a Small Island Developing State (SIDS), consists of some 1'200 widely dispersed islands that are spread over 820 kilometers from North to South. Given the country's unique geographical characteristics, it is a noteworthy that the country achieved universal access in 1999. 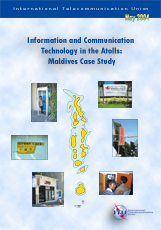 By then the partially private incumbent, Dhiraagu, was able to provide telephone service to all inhabited islands. Mobile cellular subscribers surpassed fixed telephone lines in 2002 and Dhiraagu is focusing investments on the rapidly growing mobile segment, including plans to launch GPRS. Since much time is spent on boats, mobile services are more useful and mobile coverage is widely available in sea waters. Statistics also show that a growing number of mobile users access data services over their mobiles phones. Thus the development of mobile data networks appears to be a promising solution for enhancing Internet access. A mission to the Maldives was carried out from 28 May to 3 June 2003, involving Michael Minges and Vanessa Gray. The mission and interviews were coordinated with the Ministry of Communications, Science and Technology.